Lisa tells about art history, iconography and appreciation of art and architecture, symbolism, history, legends and history of color. Starting with European Middle Ages. Once Richenau was a monastic island, one big and famous monastery with over twenty chapels and churches, monks dormitories, gardens and scriptoria. Not much is left form its former glory, but still worth a trip. During my visit at the Lake of Constance several years ago in June, Reichenau Island was warm and full of nature's riches. Sweet cherries sold at the roads close to farms were sweet and warm form the sun, and gardens were greening with salads and other vegetarian delights. My photos don't do justice. The farms are small, island itself is small, and everything seems simply charmingly rustic. In the reeds I could hear birds. I went to what is today UNESCO heritage site, Sankt Georg church, Oberzell, to see what is left from the former glory of Reichenau Abbbey. The monastic island once had 20 monasteries, 25 churches and chapels, and seven hundred monks were dedicated to cultural work. Today only three churches are left. Columban (or Colomba in Latin) the famous monk of Ireland came to the area in 610, but was not successufl in converting the Allemain pagans to new religion, went back to the Island Iona, today Scotland.Iona was a monastic island, well known today for the Book of Kells. Hundred years later, Pirin with whom is bound the simmilar legend like with St Patrick- expulsion of all snakes for the island-was the founder of the abbey in 720, just shortly after St Gallen was founded. Reichenau once was a monastic island, like Iona, had Benedictine Abbey, big and influential.It had the biggest library in the West. In its scriptorium many illuminated books were created, during the X and XI century it was a largest and most influential center of manuscripts creation, possessing huge library, very famous than, and school of painting. Renowned scholars of the day (among them Strabo) and men of great talent worked and lived there. The style of the manuscripts written and illuminated in the abbey is called Reichenau style. It is characterized by simplicity of design and soft, pastel-like colors. Click on the link to see an example of illuminated manuscript from Reichenau. And here is the splendid crozier from Reichenau, today at Victoria and Albert Museum in London.The first crown of German emperor was also made here. And here is Sankt Georg church. Often is seen on pictures surrounded by field of salad or sunflowers, I didn't have such luck. The name Riechenau means in old German Rich Island, and it was really fitting. In addition precious relics were donated, important thing during those days, among them a crucifix containing blood of Christ, as was there, also the pitcher form wedding of Cana. Any blood relics were very important. Still today in the treasury of St Mary and Marcus church, there are some objects which are preserved, not as much of them as in the times of glory. Pitcher of Can is there, blood relic is in a preserved in the church of Mary, and it is presented in procession Monday after Trinity Sunday ( don't know the day). Sankt Georg church, murals dating from the times of the Ottonian Renaissance. I apologize for the quality, but the light conditions are not favorable for photography. Could't use flash, by principle, and hate when people do, not good for the ancient paintings. Carolingian Renaissance was time of great learning, development of scholarship and arts. One of the renaissances predating Italian Renaissance, more famous and influential. What happened to this once famous abbey, center of learning spreading its culture wide? Bishops of Constance mismanaged it when he was in charge of it, starting during XVI c. also the fame of competing St Gallen not too far from the area was a downfall, in addition the forced secularization (XVIII c. finished beginning XIX c.) was a final blow: monks needed to leave, the library of precious manuscripts was send to museums. Over twenty churches and chapels were demolished with dynamite. And act of iconoclasm for sure, this time the secular one. Here are some grave stones from the St Georg church. 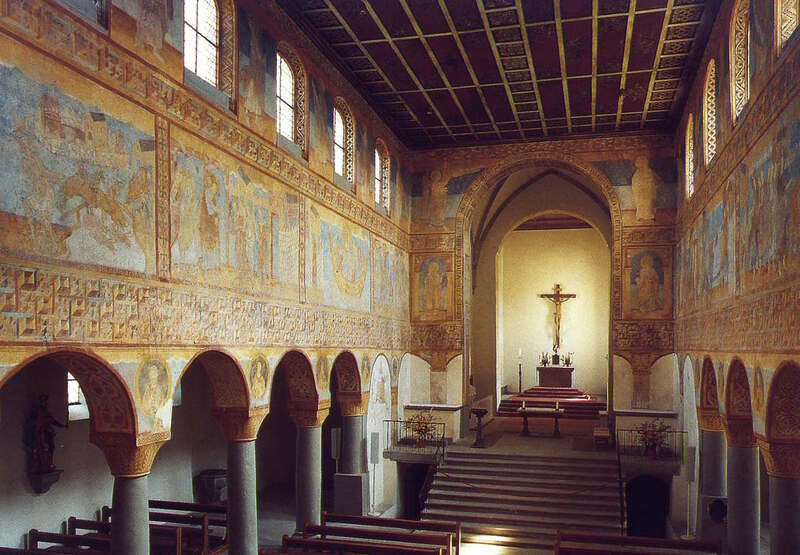 The glory of Reichenau abbey is lost, but what we have left is beautiful anyway! And what about Ottonian renaissance? It was fueled by closer contact with Byzantium, where the traditions of Antiquity were still alive.And the schism between the Orthodox Christianity and the Latin one was not there, the church was still united. This came because emperor Otto had a Byzantine wife, Theophanu, learned and literate. (He himself was illiterate). Theophanu was an intelligent ruler who brought progressive Byzantine ideas, used diplomatic skills and learned in Byzantium strategies to make her place in history. There were also other learned and influential women of those days, princess Theophanu was the first one. From the family of the emperor there were also women who greatly supported art and learning. There is another side in Reichenau: holy blood relic. About it tomorrow. Lost Secrets of Chartres Blue? History of color, and why astrology in a church?